A $44 million 820 kilometer fiber optic cable being laid between Pakistan and China will be the 6th high-speed connection to add redundancy and to cater to rapidly growing Internet traffic from-to Pakistan. It is part of the $46 billion Pak-China Economic Corridor project recently agreed between the two neighbors. Pakistan is currently connected with the world through four undersea fibre optic cables. These include India-Middle East-Western Europe (I-ME-WE), Southeast Asia-Middle East-Western Europe 3 (SEA-ME-WE-3) and Southeast Asia-Middle-East-Western Europe 4 (SEA-ME-WE-4), operated by Pakistan Telecommunication Company Limited (PTCL) and TWA-1, which is owned by Trans-World Associates. A fifth undersea cable called South East Asia-Middle East-Western Europe (SEA-ME-WE)-5 is being laid to connect Pakistan with the rest of the world, according to Pakistani media reports. The overland fibre optic cable is being laid by Chinese company Huawei between Rawalpindi and Khunjarab Pass on Pakistan-China border, a distance of 820 kilometers, according to media reports. When completed, this project will provide Pakistan with a direct telecom access to China and the Central Asian States, and from there to Europe and the United States. Pakistan needs multiple fiber connections to the outside world to prevent the kind of major Internet outages the country has suffered periodically for the last decade. For example, a major disruption occurred in June 2005 when ALL Internet access from Pakistan was lost due to damage to the lone undersea fiber optic cable in the Arabian Sea connecting the nation with the rest of the world. There were satellite links but these links have very limited bandwidth. Even though the number of Internet users in Pakistan was relatively small at about 15-20 million, the impact on business was disproportionate. Traders on KSE reported as much as 80% drop in trading volume from this outage. All call center activities and other BPO vendors were severely affected. Then there were more episodes of severe disruptions in 2008 when several undersea cables were cut. The Maldives were 100 percent down, followed by India, which had 82 percent disruption. Qatar, Djibouti and the United Arab Emirates were the next most widely affected areas with about 70 percent service interrupted. Disruptions for Saudi Arabia, Egypt and Pakistan ranged from 51 percent to 55 percent. The increasing number of external fiber connections will help minimize disruptions in Internet connectivity and help deal with its impact on Pakistan's businesses, industry and security. High-speed Internet connectivity is at least as essential as other forms of communication, if not more so. Pakistan is investing in it for its economic and national security. Investments in this area need to be continuously boosted as the user base grows in the country. With the help of the Prime Minister Meeting mechanism between China and Pakistan, in June 2010, China Telecom and SCO (Strategic Communications Organization) of Pakistan decided and signed the C&MA Agreement for China-Pakistan terrestrial optical fiber cable. After completion of this cable, the telecommunications between China and Pakistan will be totally changed. In October 2010, China Telecom successfully commissioned a fiber cable with Kyrgyzstan, which indicated that the breakthrough had been made for the Middle-Asia information highway and which paved a way for the Internet connection and voice service to the Middle-Asia countries. With many land and submarine cable systems constructed, China Telecom has completed a comprehensive network in Asia-Pacific and could act as a gateway and a bridge for all the operators in the other continents of the world to establish communications with many countries bordering with China. Any chance of laying an optic fiber cable from Gawadar (Pakistan) to Iran and then to Turkey? For us, that's the closest land route to Europe. Recently, internet users in Pakistan have been complaining about slow internet and disrupted connectivity. It turns out that this has been caused by a fault in SEAMEWE4, one of Pakistan’s most important submarine cables. According to sources, the fault occurred near Karachi and is a physical fault. While the exact location of the fault has been identified, rectification procedures are taking longer than expected. PTCL relies heavily on SEAMEWE4 and sources have confirmed that in order to save users from the inconvenience they are facing, bandwidth is now being shifted to other submarine cables. Establishment of an information corridor will ensure the success of the China-­Pakistan Economic Corridor (CPEC) and yield many benefits, experts said. "In order to support, supplement and sustain the CPEC, there should also be an information corridor, which will serve as a platform between Chinese and Pakistani companies to provide database, share information and promote e-commerce between the two sides," Pakistani Senator Mushahid Hussain Sayed, who is also the chairman of the Pakistani Senate Defense Committee, told the Global Times on June 16. Sayed served as Pakistan's Minister of Information and Broadcasting during the 1990s. Leading telecom network service supplier ZTE just completed a project called DTMB (digital terrestrial multimedia broadcast) in Pakistan in March. The project allows residents around Islamabad, capital of Pakistan, to receive TV signals once they install a set-top box. The DTMB project belongs to the earlier harvest projects of the CPEC. Experts said the project contributes to the establishment of an information corridor and brings Chinese telecom standards to Pakistan. "Currently, there are four standards in the world: Chinese, European, Japanese and American. The project is significant as Pakistan is a country with a population of nearly 200 million," said Han Song, chief marketing officer of Zhongxing Telecom Pakistan (Pvt) Ltd, noting that it took five years to persuade Pakistani partners to adopt the Chinese standards. Zhongxing Telecom Pakistan (Pvt) Ltd is ZTE's subsidiary in Pakistan. "The upgrade from analog signals to digital signals means the number of available channels are multiplied. As the local media can only provide enough content for eight channels, the project creates room for Chinese media outlets to broadcast their programs after agreement with Pakistani authorities," Han told the Global Times on June 15. "For example, after the completion of our program, the China Central Television began to air two channels of programs in Pakistan since March," said Han. Chinese companies also help guard the cyber security of Pakistani clients. "We are victims of cyber warfare from other countries so it is very important that we have cyber security and cyber protection on our own infrastructure," Sayed said, referring to Edward Snowden's leaks about the intelligence gathering project PRISM of the National Security Agency of the US. "Many Chinese companies and foreign companies doing businesses in Pakistan may have concerns over cyber security in Pakistan. And we help them in this regard," Han said. "Due to the all-weather relationship between China and Pakistan, there is a high level of trust over security issues," Han noted. According to the 2014 annual report of Pakistan Telecommunication Authority published in January, the overall telecom investment in the country reached $1.82 billion in fiscal year 2014, a 200 percent increase over the $600 million in 2013. Pakistani telecom sector attracted over $903 million in foreign direct investment (FDI) in the fiscal year 2014, accounting for 34.2 percent of the total FDI received by Pakistan. Pakistan and China have agreed to develop an e-corridor to establish greater connectivity, keeping in view the importance of the China-Pakistan Economic Corridor (CPEC). The agreement was reached during a meeting of a high-level Chinese delegation, led by China Investment Promotion Centre Chairman Yan Lijin, with Minister of State for Information Technology and Telecommunications Anusha Rehman. The minister apprised the delegation of the potential of Pakistan’s IT and telecom sector and how the ministry was working to reap this potential in an optimal way. “We believe in a ‘Digital Pakistan’ and Chinese cooperation and collaboration will help us to materialise this vision of accelerated digitisation,” she said. She said the ministry was already collaborating for the development of an ‘e-commerce gateway framework’ so that online commercial ventures could flourish further and consumers and companies could get more confidence in online payment systems. “We would like to invite international companies to establish their setups here in Pakistan as well,” she added. Will this new internet nodes help to boost internet speed in the country?? ZB: "Will this new internet nodes help to boost internet speed in the country??" The fiber being is put in to boost backbone bandwidth to handle increased Internet data traffic generated by growing number of users. Multinet Pakistan, a voice and data company, and Omantel of Oman yesterday announced the initiation of a new submarine cable network “Silk Route Gateway 1” to connect Karachi with Barka (near Muscat in Oman) with a strategic landing point at Gawadar in future. SRG1 is going to be 900 kilometer long submarine cable with two fiber pairs system design with capacity of 10Tbps of communication per fiber pair. Future extension of SRG1 includes a branching unit through Gawadar to connect the next economic hub of Asia with a direct international link. Current consortium members for SRG1 are Multinet and Omantel and they are already in talks to accept another one or at most two members to be part of SRG1. Multinet said that SRG1 will be completed and operational in 18 months from today at a cost of USD 24 million. For the purpose SRG1 consortium yesterday signed Xtera as turnkey vendor for the establishment and maintenance of submarine cable. Upon completion, Pakistan will immediately get 200Gbps of additional bandwidth, however, this capacity could be upped to 20Tbps with time, mainly based on market demand. With Multinet as part of SRG1, the duopoly of PTCL and TW1 in space of international bandwidth will end. Market sources suggest that Multinet’s entrance in market is going to reduce internet bandwidth prices for Pakistani ISPs and telcos by at least 60%. Sources said that current bandwidth rate of USD 3,000 per STM1 are expected to hit USD 1,200 per STM1 till end of 2017. While 3G/4G mobile internet has catered to the nation’s demand for high-speed internet, it is just not viable for everyone; especially for businesses and power users who need to consume high volumes of data at very high speeds. There’s a reason the west has resorted to FTTH and that’s mainly due to its reliability, consistency and capacity to control higher data speeds. While FTTH in Pakistan is comparatively a new phenomenon, mainly due to its limited coverage, things have started to change now. Storm Fiber, a Cybernet company, is offering its FTTH services in Lahore and Karachi at unbelievable prices. For example, you can enjoy 30Mbps for just Rs. 3,999. This price includes cable TV and fixed line as well as a value addition. Not to mention, this speed of 30Mbps is valid for both uploads as well as for downloads. Storm Fiber said that these prices are excluding taxes, but there’s no limit on download/upload and customers can enjoy true unlimited data connections throughout the month. The project is being built by the Special Communication Organisation (SCO) in collaboration with China’s Huawei, Senior SCO Project Manager Muhammad Adil said. “The Pakistan-China optic fiber cable project will be beneficial for [establishing] a strategic link between both Pakistan and China,” Adil said. One of the aims of the project is to establish a safe route for voice-traffic between the two countries, he added. The foundation stone for the cable was laid in May this year. Adil said that around 18.2km portion of the fiber optic cable would pass through federal capital, 466km from G-B, 280km from Khyber-Pakhtunkhwa, and 47km from Punjab. Pakistan has established its first Internet Exchange Point (IXP) for all local ISPs that will help reduce latency rates for all domestic traffic. Previously Pakistani Internet traffic was routed through foreign internet networks and exchanges, even for local traffic. This will change now as local peering will be allowed, ultimately resulting into lower pings and response times for domestic requests. According to the Telecommunication Policy 2015, "Internet and other traffic will be exchanged within Pakistan using local peering or exchange points as far as it is possible to do so, recognizing that the use of international peering points in other countries imposes an unnecessary cost burden and a potential security risk." "PTA will take appropriate measures in consultation with stakeholders to encourage establishment of local peering and exchange points of IP traffic on legally established gateways in Pakistan." If a customer is using a local ISP and if a ping is sent for a website or server that is hosted on TransWorld for example, then traffic is routed through international exchanges that reside outside Pakistan. This traffic will now be routed within our local Internet Exchange after its set up. Such an internet request, which is local — and distance between client and server could be just few kilometres — has to travel the all way to an exchange that’s hosted abroad and then will hit back local server after travelling thousands of kilometres, increasing latency rates and decreasing data transfer rates. This internet exchange is going to help local hosting companies, data centres, service providers, banks, corporations and everyone who is hosting websites or services with-in Pakistan. It will also benefit ISPs greatly by not only enhancing their performance but also by reducing their bandwidth costs. The total number of broadband subscribers has crossed 38 million by the end of October 2016. According to the latest data of Pakistan Telecommunication Authority (PTA), the number of broadband users has reached 38076286. Addition of 35.45 million mobile broadband subscribers Since the launch of 3G and 4G LTE services, mobile broadband subscribers have reached 35.45 million. The total usage of data during September 16 to October 16 was 53,340 terabytes. 2G share remained 87 percent in terms of voice, while 13 percent was data share. In 3G technology, 3 percent was voice, while 97 percent was data usage. Before 3G and 4G launch, the total volume was 1,243 Tbs in January 2014, whereas, it increased gradually after 3G launched. In December 14, the total usage was 6,903 terabytes which increased to 23,980 in December 2015. In September 2016, the data usage was 45,672 terabytes. The PTA data also claimed that the teledensity has reached to around 71 percent. It indicates that majority of people now have access to basic voice telephony, mostly on mobile phones. The SEA-ME-WE 5 Consortium completed deployment of a 20,000-kilometer subsea fiber infrastructure developed by a 16-nation consortium. The system is designed with 24 terabits per second of capacity on three-fiber pairs, said it be capable of accommodating data demand from bandwidth-intensive applications such as enterprise data exchange, internet TV and online gaming. The consortium noted the cable’s main endpoints are carrier-neutral/open points-of-presence connecting Singapore with Malaysia, Indonesia, Myanmar, Sri Lanka, Pakistan, Oman, the United Arab Republic, Qatar, Yemen, Saudi Arabia, Djibouti, Egypt, Turkey, Italy and France. “The completion of the SE-ME-WE 5 project is a landmark system upgrade for all data users worldwide. This system facilitates a new age of digital transformation and innovation, catalyzing greater economic activities, trade and growth across three continents,” said Linette Lee, chairperson of the SEA-ME-WE 5 Consortium Management Committee. Consortium members include Bangladesh Submarine Cable Company, China Mobile International, China Telecom Global, China United Network Communications Group Company, Djibouti Telecom, Emirates Integrated Telecommunications Company, Myanmar Post and Telecom, Ooredoo, Orange, PT Telekomunikasi Indonesia International, Saudi Telecom Company, Singapore Telecommunications, Sparkle, Sri Lanka Telecom PLC, Telecom Egypt, Telekom Malaysia Berhad, TeleYemen, Turk Telekom International and Trans World Associates Limited Pakistan. A top military official on Tuesday said some incoming and outbound internet traffic landed in India before being routed to its destinations, posing a security risk for Pakistan. Pakistan and China will inaugurate on Friday an optic fibre cable that has been laid to provide direct link between Pakistan, the Middle Asia and East Asia. Army chief General Qamar Javed Bajwa, Prime Minister Nasirul Mulk, Chinese Ambassador Yao Jing, Special Communications Organisation (SCO) director general and Huawei Middle East Region President Charles Yang will be present at the inauguration ceremony that will be held in Islamabad. 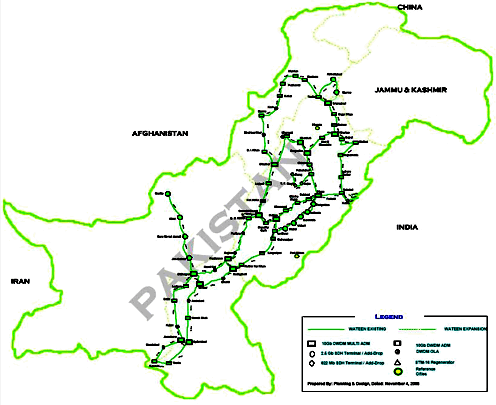 The cable connects Rawalpindi with Khunjerab on the Pakistan-China border at an altitude of 4,700 meters, the highest fibre cable project in the world. Later, the cable will be extended to Gwadar, which will fully connect Pakistan and China. It is the first project under the early harvest programme of the China-Pakistan Economic Corridor (CPEC) and the only information and communication technology (ICT) project under CPEC. Total cost was estimated at $44 million and Exim Bank of China provided 85% of loan at a concessionary rate. The project is owned by SCO and its engineering, procurement and construction (EPC) contractor was Huawei. Construction work on the project started in March 2016 and ended in June 2018. The cable covers an area of 820 km. There are 26 microwave transmission nodes from Rawalpindi to Karimabad and 171 km of aerial fibre cable from Karimabad to Khunjerab as a back-up. After two years of hard work by SCO and Huawei, the project stands complete and ready for commercial use. The optic fibre cable will provide direct connection between Pakistan, the Middle Asia and East Asia and minimise the risk of disruption to international traffic. It will also provide multiple international links with the new Gwadar landing station in order to reduce discontinuity issues. The project will help improve the telecom and ICT industry of Pakistan, promote tourism and create trading opportunities for northern areas of the country. It will also provide the ICT infrastructure for 3G/4G services in the northern areas and enhance communication security with an alternative fibre route.